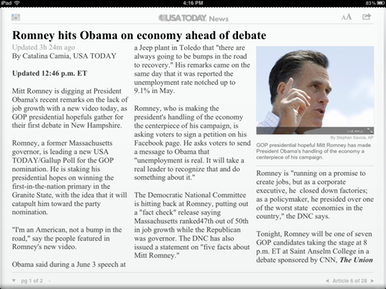 USA Today for iPad arrived in the App Store shortly after the original iPad made its debut. That initial release was decent, but buggy and flawed—certainly not up to the standards set by the iPhone version of USA Today. More than a year later though, USA Today has had some time to work out the kinks with its iPad release. But does the revamped version deserve a spot on your iPad? Viva Sections: When USA Today first launched, Tech and Travel were MIA. We’re delighted both sections appear in the app now. USA Today really attempts to make its app resemble its newspaper counterpart. Thus, the app avoids most visual navigation elements when you launch it. Instead of using a more traditional tab bar, you jump between sections by tapping on the large, colorful square at the app’s upper left corner. Tap it, and you get icons for all of USA Today’s sections—and that all is a good thing. When the app first launched, it lacked the paper’s Tech and Travel sections; their appearance in the app is a welcome improvement. Also welcome: The app is far less buggy than it used to be. It may be a bit odd to praise USA Today for loading the sections you tap on, but since that functionality wasn’t quite operating at 100 percent the last time we reviewed this app, it’s worth celebrating here. Sadly, USA Today’s general layout problems remain largely unchanged—and what changes appear aren’t necessarily for the better. We complained a year ago about the blurbs that appear below each headline as you browse the paper’s sections. Back then, USA Today simply pulled the first sentence of each article, and those sentences would often end abruptly, because they didn’t fit the allotted space. Now, it appears that someone at USA Today is handcrafting the blurbs—I found several that didn’t appear to exist within the articles themselves. But here’s the kicker: These manually written blurbs still don’t fit, and thus still make the app look rather dopey: “A Missouri River levee failed near the Iowa-Missouri border Monday, prompting a flash flood warning for the,” one reads. That USA Today still can’t figure out a way to fit its blurbs is either tear or laughter inducing; I’m not sure which. Column as I see 'em: USA Today's use of columns feels cramped and unnecessary on the iPad. USA Today’s article view remains mostly untouched. Articles are broken into columns (two in portrait, three in landscape). You swipe left or right to move between articles, and swipe up and down to advance between pages of an individual article. I don’t love multicolumn text in The Daily, and I don’t love it here, either. It works fine, but it breaks with what’s become iPad convention. Most apps focused on reading fit their content into a single, scrollable column. USA Today violates both tenets, with multiple columns, and scrolling by the page instead of freeform. Again, though, it’s manageable—just not to my taste. That said, USA Today is a solid app, and you can’t beat the price: The app remains completely free, and while the company said at launch that one day we’d need to pay for our digital subscriptions, it appears that—for now, anyway—the ad-supported model still works in this case. Adding the missing sections and fixing the annoying bugs made USA Today go from decent to good. To enter the realm of greatness, the app’s designers need to focus a bit more on its presentation.